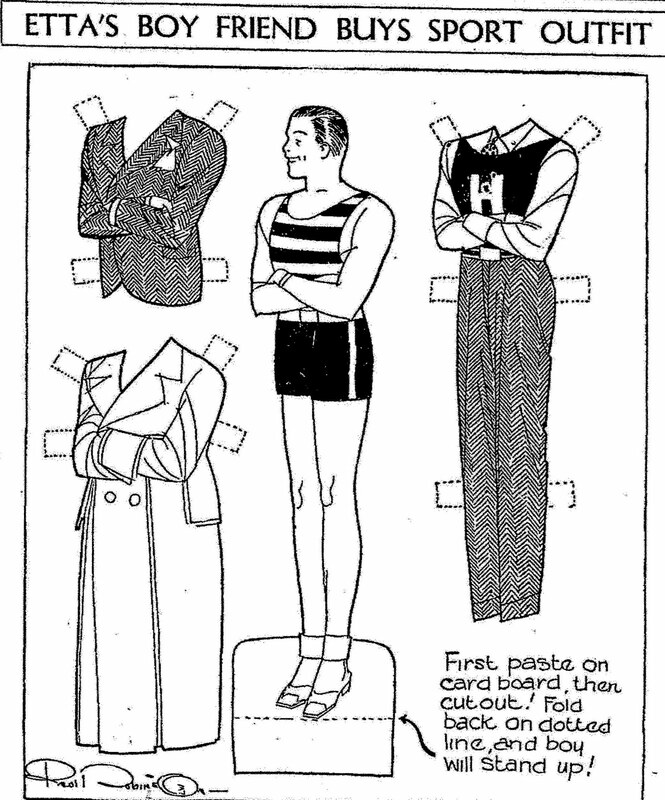 Etta Kett's Boy Friend paper doll appeared in newspapers on August 03, 1933. 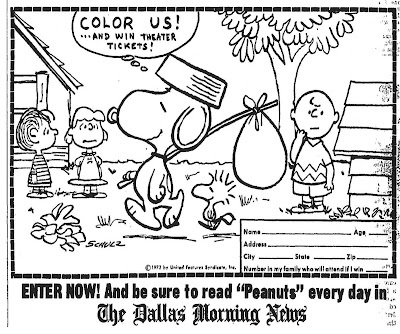 SNOOPY, COME HOME Movie Coloring Contest appeared in the Dallas Morning News on June 11, 1972. 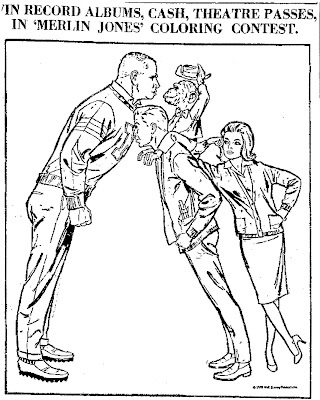 The second "Peanuts" feature film. 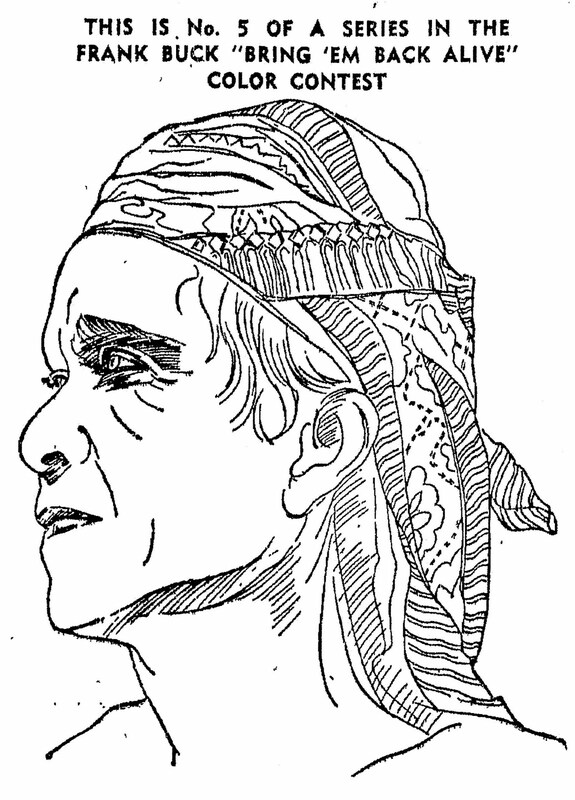 The Director was Bill Melendez. I am so thankful that my childhood was of the Charlie Brown era and not the Bart Simpson era. I detest all the animated shows that come on television in prime-time. 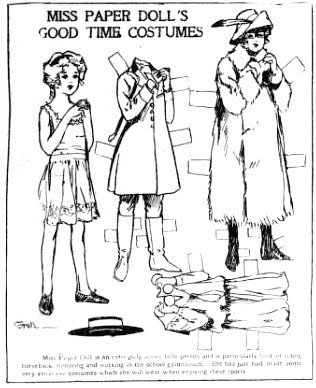 GALE, a paper doll from the Laura Brock newspaper paper doll family series in 1933. The best show on television, THE AMAZING RACE, is back again. The contestants seemed to have had a lot of fun in England, storming a castle and "battling" a knight in a suit of armor. 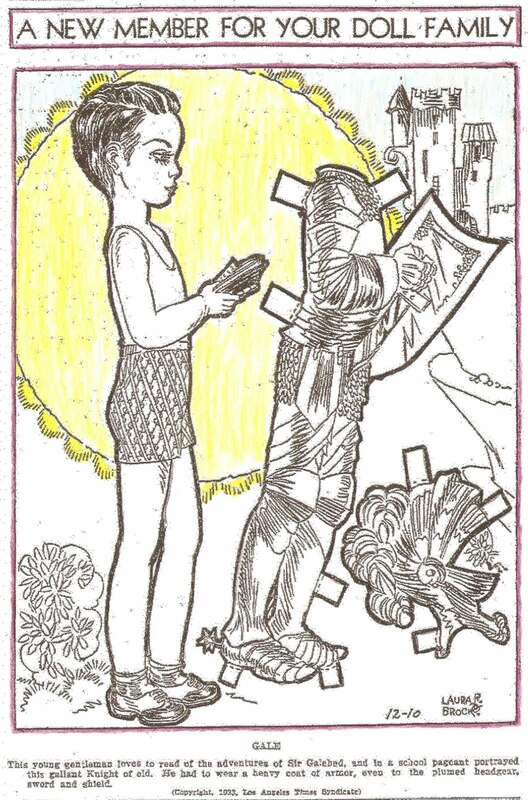 Gale, the paper doll, dreams of being Sir Galahad with his suit of armor. 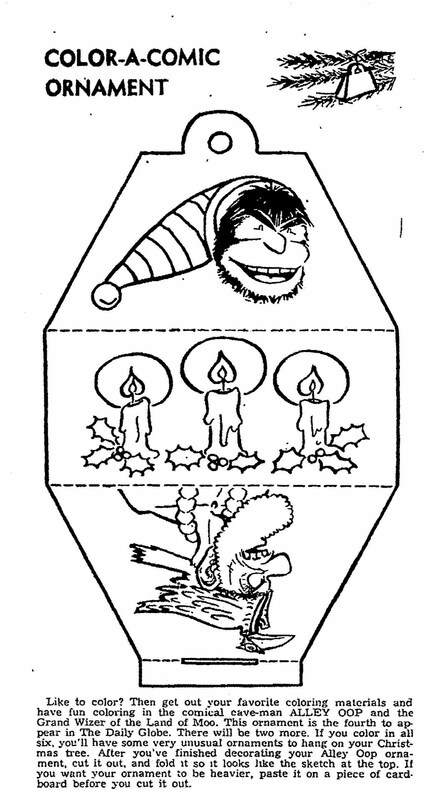 Two from a series of six Color-A-Comic Ornaments that ran in various newspapers in December of 1961. 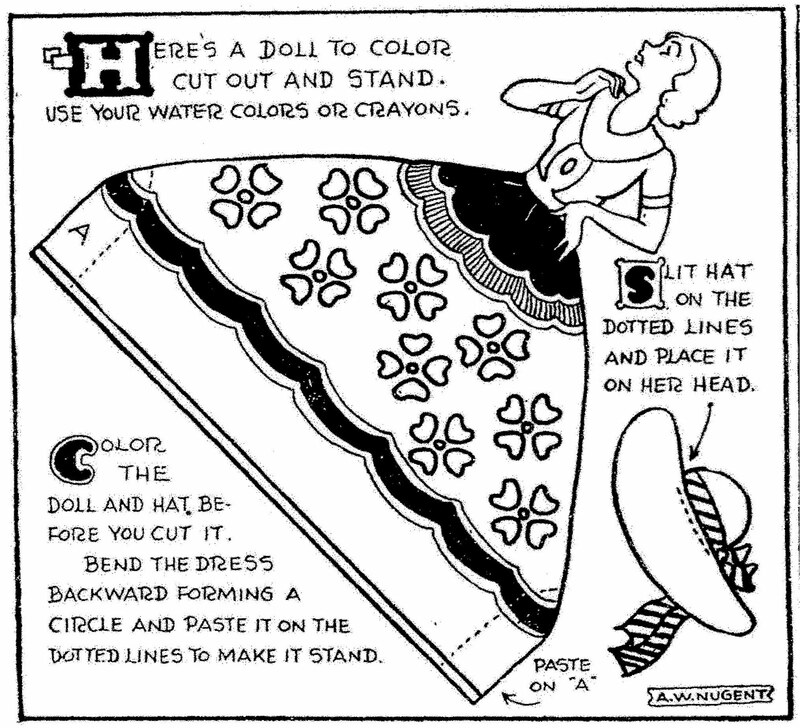 Alley Oop, one of the "classic" comic strips, was created by Vincent T. Hamlin in 1933. 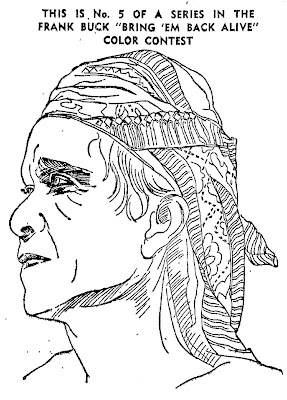 Priscilla's Pop was created in 1947 by Al Vermeer. Merry Christmas in September. 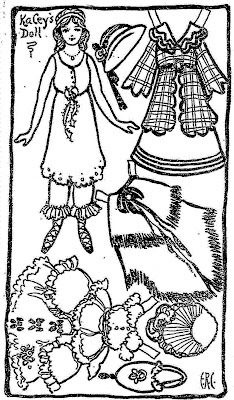 The Frog Prince paper doll from the Cut-Outs For Children series, September 01, 1912 and the lady paper doll (I named her Florence) from August 18, 1912. 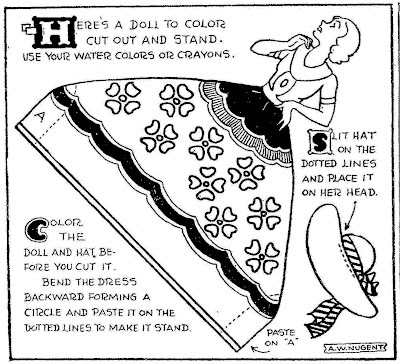 This is the fifth picture in a series of six from the "Bring 'Em Back Alive" movie coloring contest that appeared in newspapers in 1943. 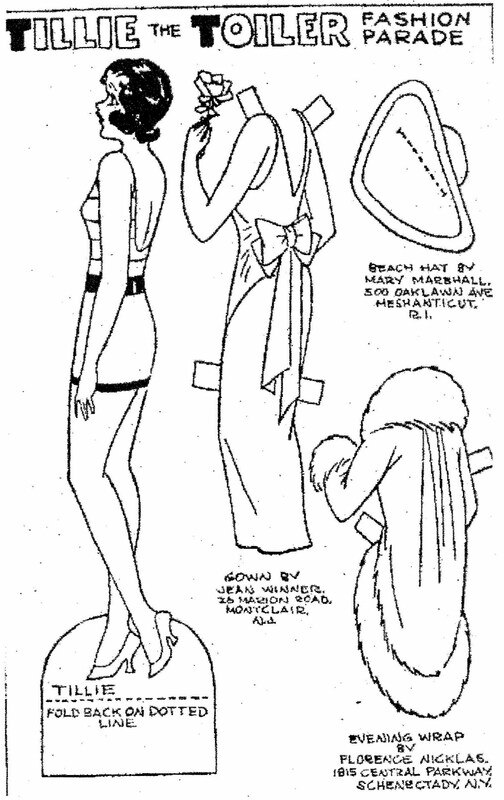 Appeared in various newspapers on April 09, 1933. Another A. W. Nugent paper doll that appeared in newspapers in 1933. 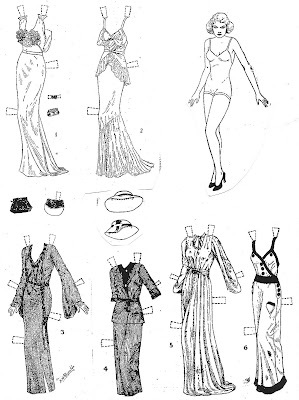 Jean Harlow paper doll from the Movie Star Paper Doll Series that ran in a Brownsville, Texas newspaper in 1935. 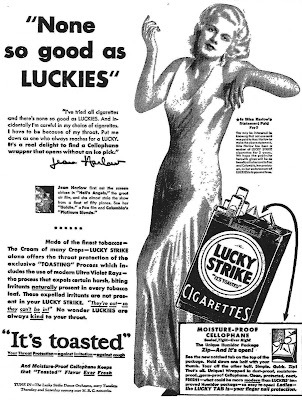 Jean Harlow in a newspaper Ad for Lucky Strikes cigarettes from 1931. 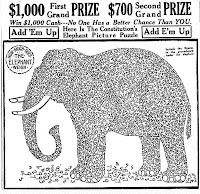 Scramblegraph Contest that ran in newspapers in 1933. 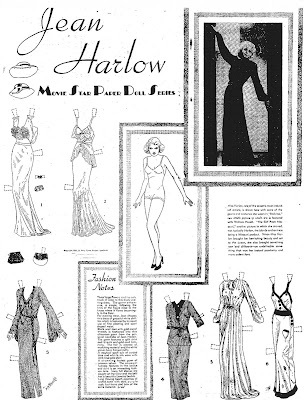 Jean Harlow was No. 17 in the contest. I rushed the folding so my end result is not very neat. 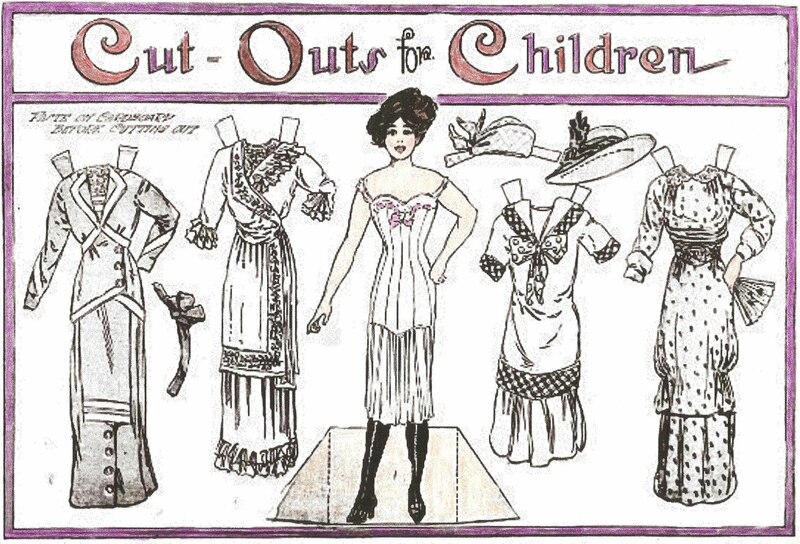 Miss Paper Doll's Good Time Costumes from the Miss Paper Doll newspaper series appeared in The Call on March 30, 1912. 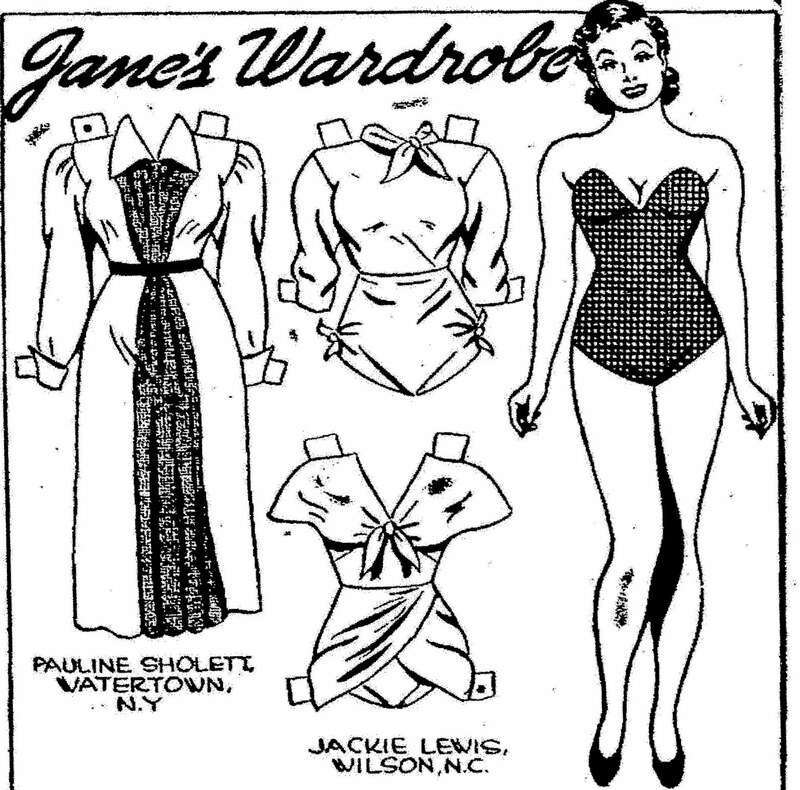 This very shapely Jane Arden paper doll appeared on April 08, 1950. 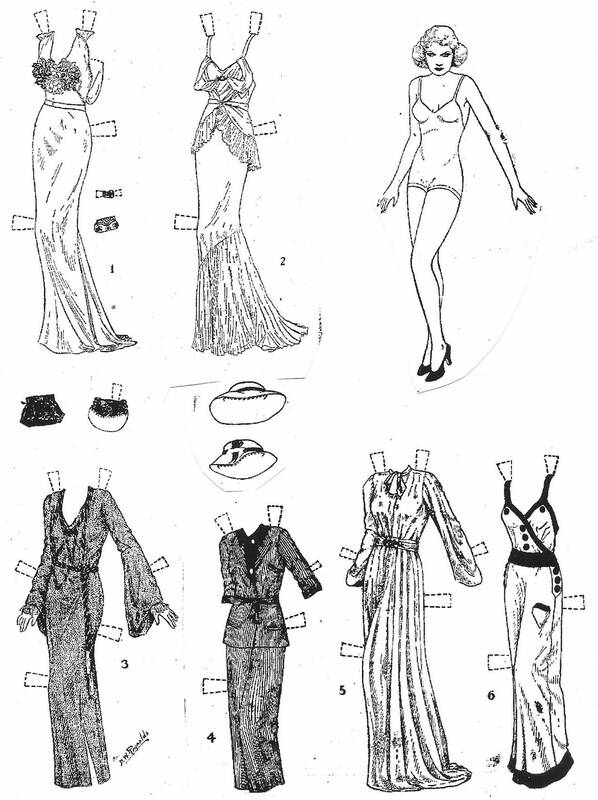 This Tillie paper doll is from June 19, 1932. I just found this contest a few hours ago and I really like it. 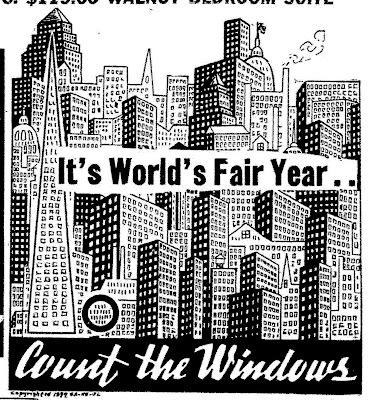 JUST COUNT THE WINDOWS in the New York City skyline. The grand prize was a trip to the New York World's Fair. 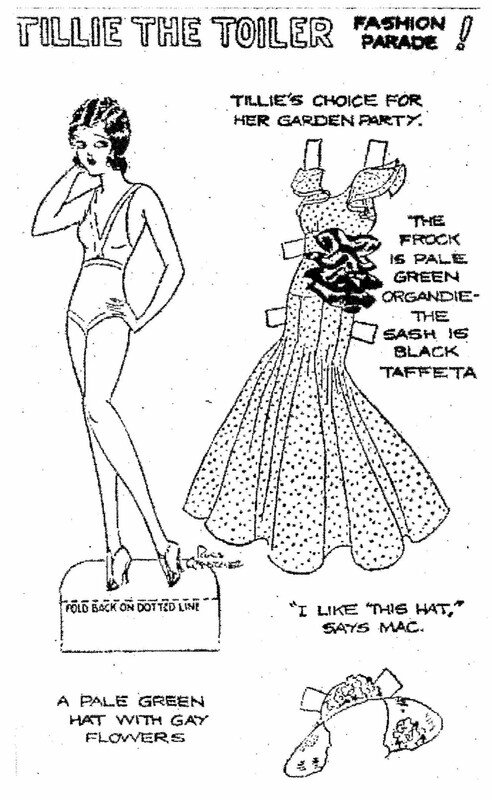 The contest appeared in a Wisconsin newspaper on August 14, 1939. 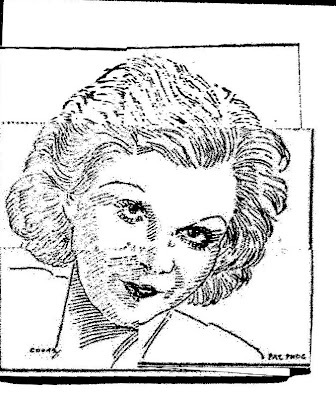 VALLEY OF THE SUN starred Lucille Ball, Cedric Hardwicke, Dean Jagger, James Craig, Billy Gilbert, Antonio Moreno and Tom Tyler. 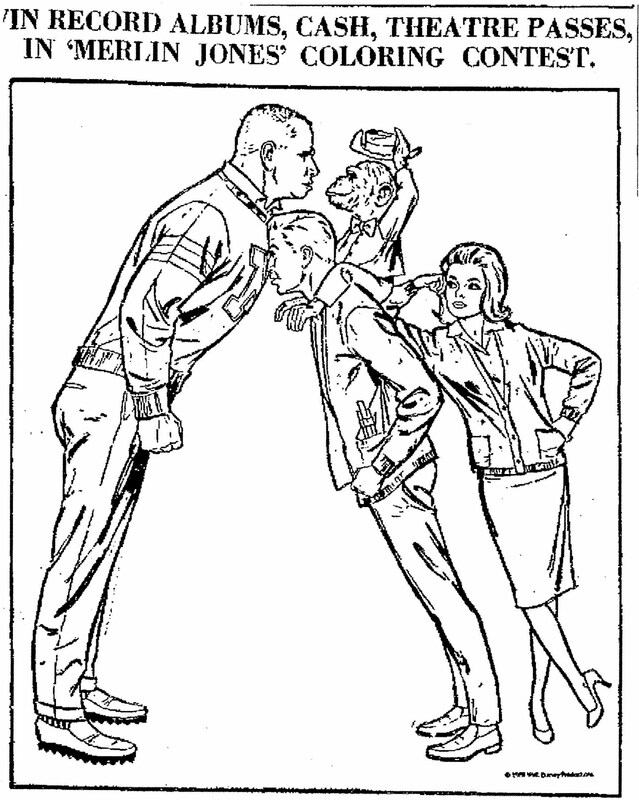 Directed by George Marshall. The movie received good reviews. 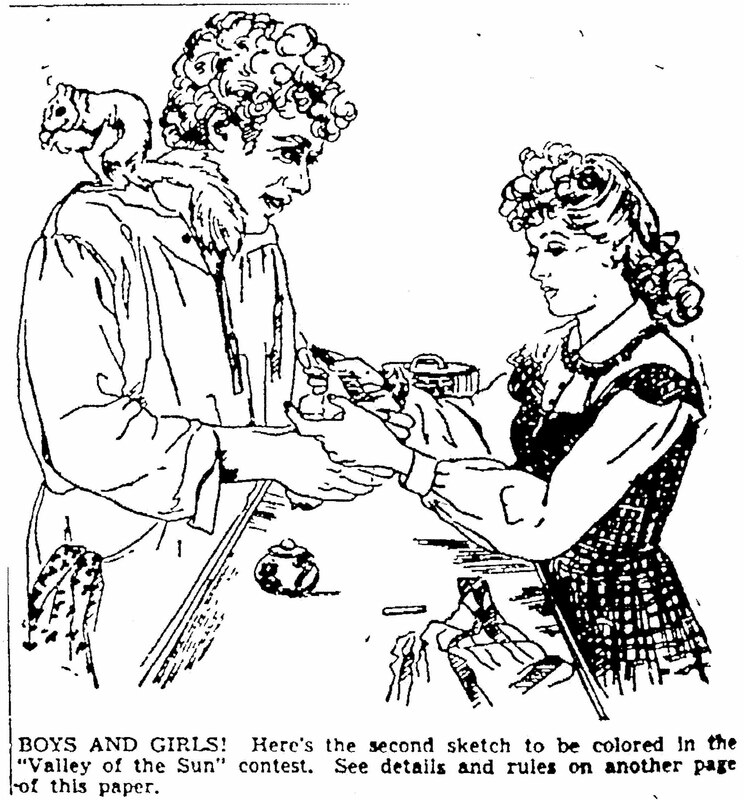 This newspaper movie coloring contest appeared on February 25, 1942. The TILLIE paper doll appeared in the comics on September 26, 1932 and the WALLY WHIPPLE paper doll appeared on June 12, 1932 in the Albuquerque Journal. 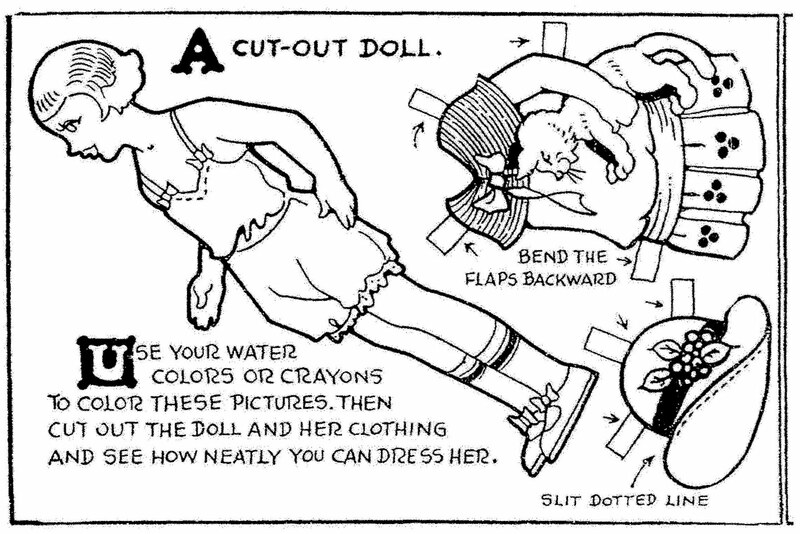 Mary Had A Little Lamb paper doll by A. W. Nugent from December 18, 1932. 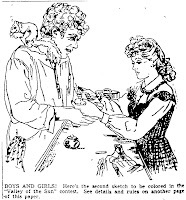 Mark Twain's story turned into a Bing Crosby musical. 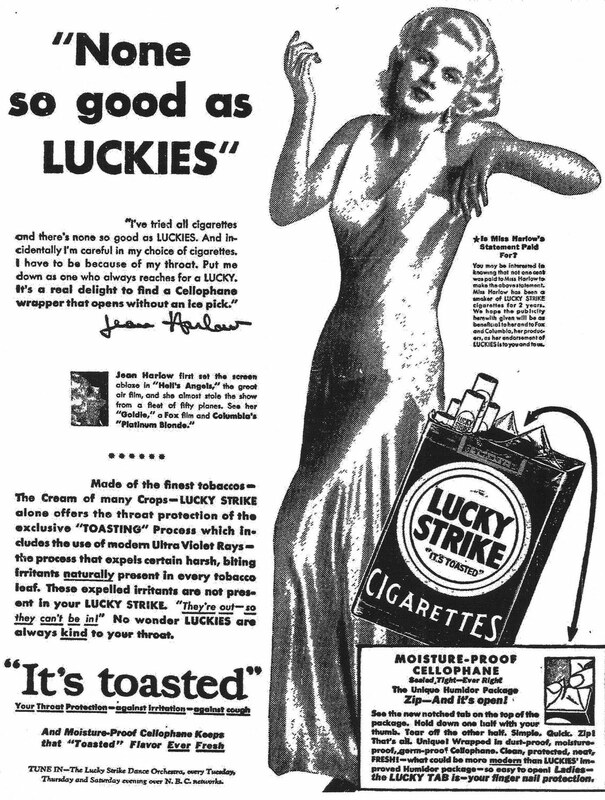 A Connecticut Yankee In King Arthur's Court starred Bing Crosby, Rhonda Fleming, William Bendix, Cedric Hardwicke, Henry Wilcoxon, Murvyn Vye and Virginia Field. Tay Garnett directed the movie. I remember watching this movie many years ago on T.V. and enjoying it. Bing Crosby is one of my favorite singers. 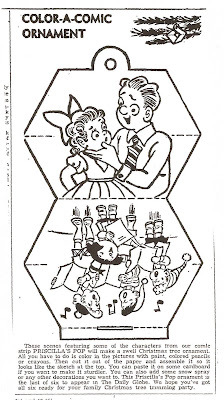 This movie coloring contest ran in a Minnesota newspaper on April 23, 1949. The Strong Man was the first feature film of the legendary Director, Frank Capra. 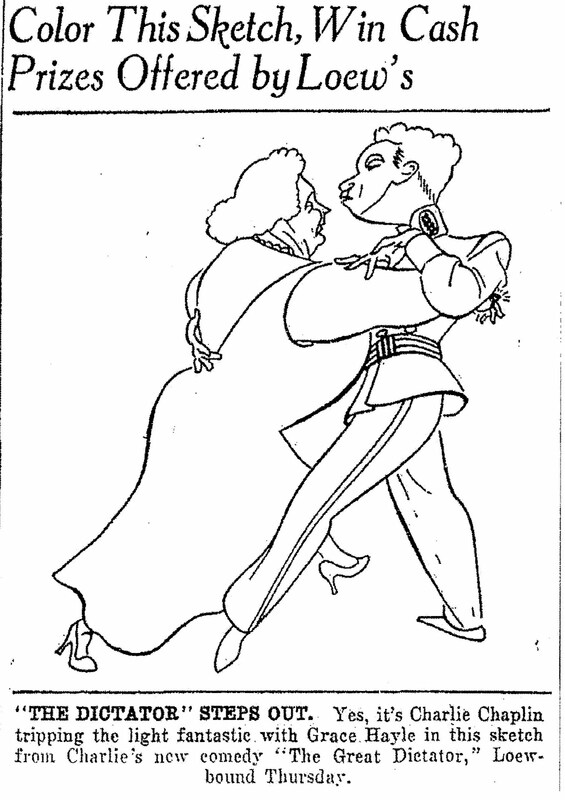 The movie starred Harry Langdon, Priscilla Bonner, Gertrude Astor, Brooks Benedict, Arthur Thalasso, Robert McKim and William V. Mong. 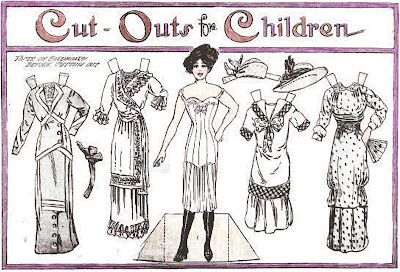 Harry Langdon played a WWI veteran who comes to America in search of the girl he corresponded with during the war. 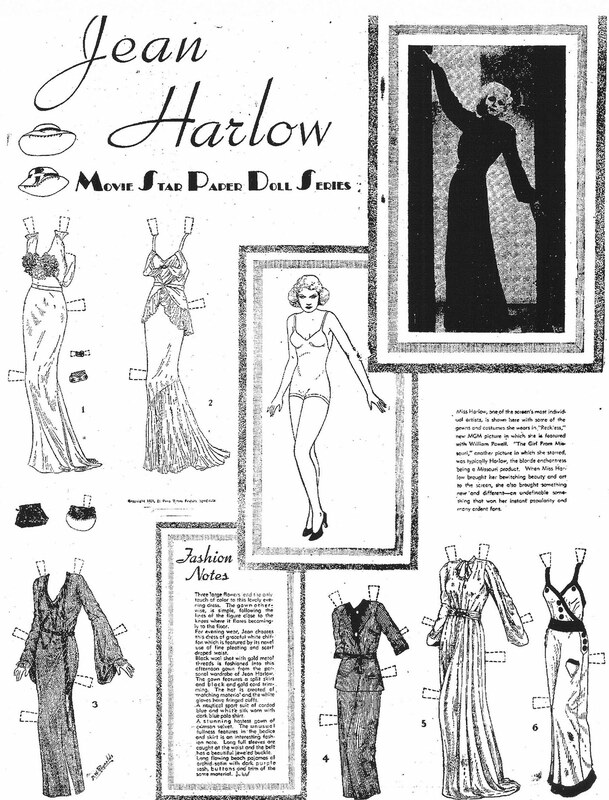 The movie received very good reviews as did the star, Harry Langdon. GUESS HOW MUCH? Contest. The figured gentleman above is Harry Langdon. Every correct answer to the total of the figures on his suit will win two tickets to the Sigma theater to see "The Strong Man." 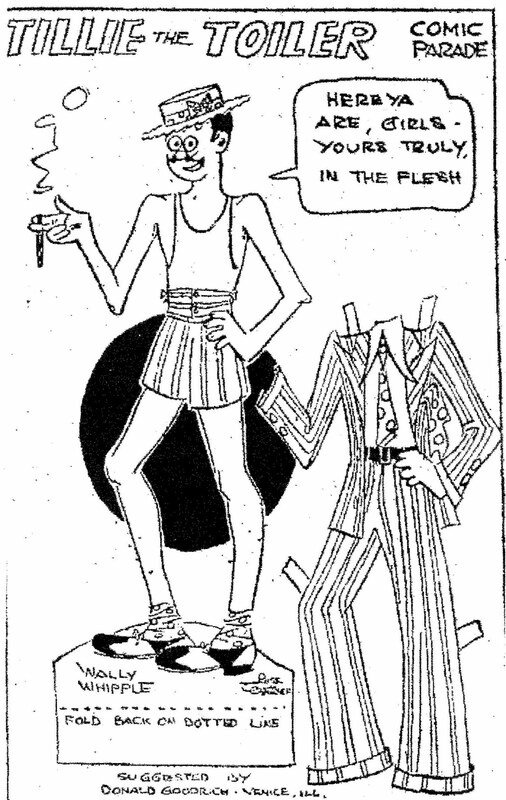 This contest ran in an Ohio newspaper on November 16, 1926. 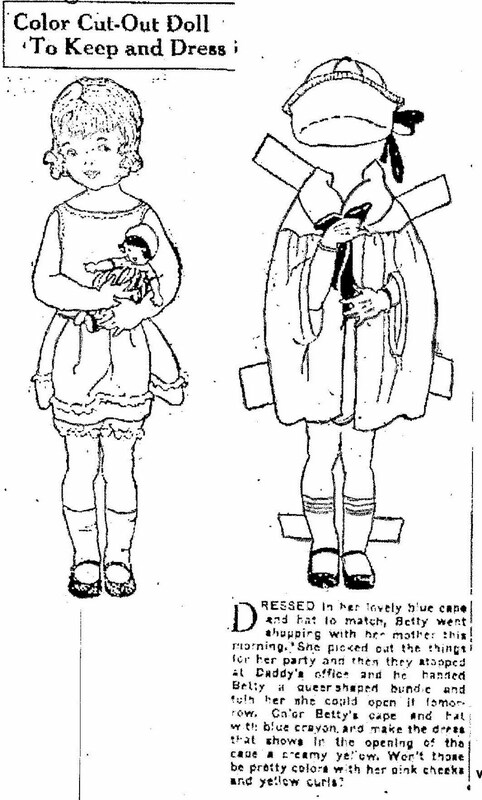 This paper doll appeared in a Montana newspaper on June 03, 1923. 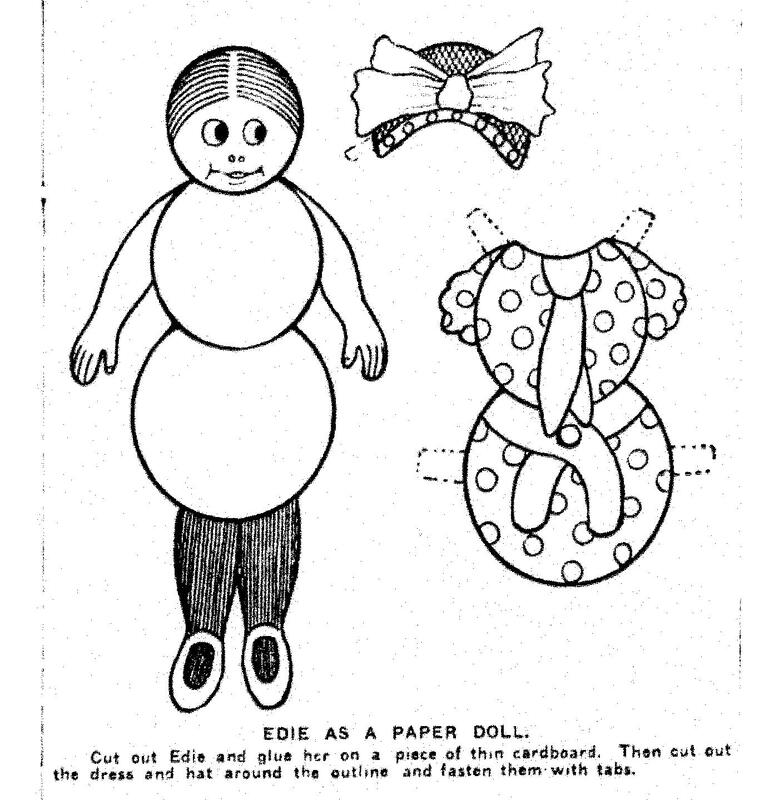 Edie As A Paper Doll appeared in the New York Tribune on October 12, 1913. How Much Does The Elephant Weigh? 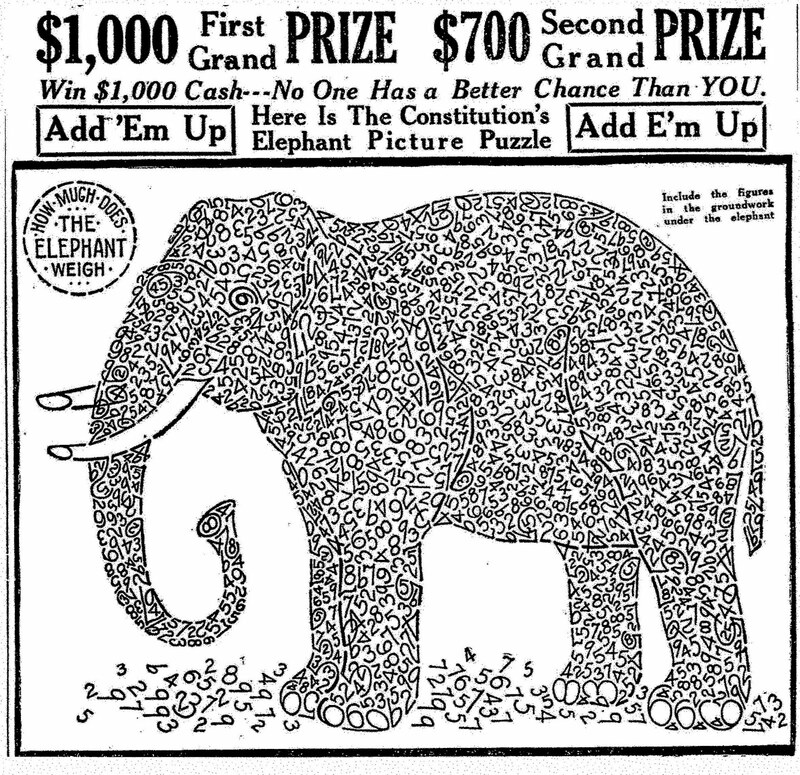 Here is the Atlanta Constitution's Elephant Picture Puzzle from November 05, 1924. I really like this counting contest puzzle. 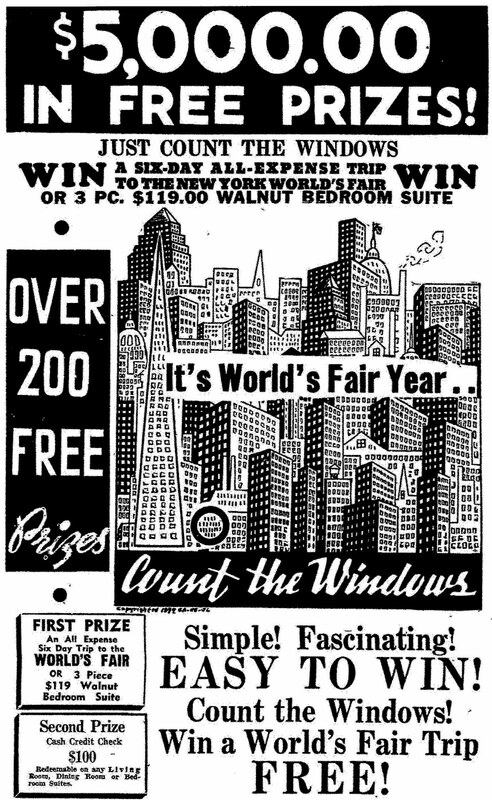 This contest ran in newspapers in 1954. 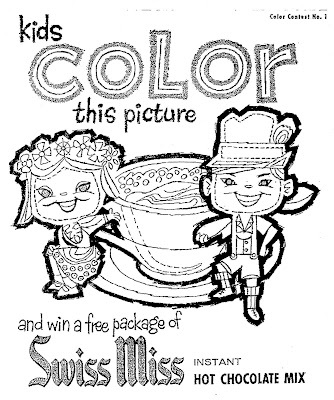 "Just count the Diamonds in this Red Diamond Instant Coffee Drawing." There were 101 Prizes up for grabs. 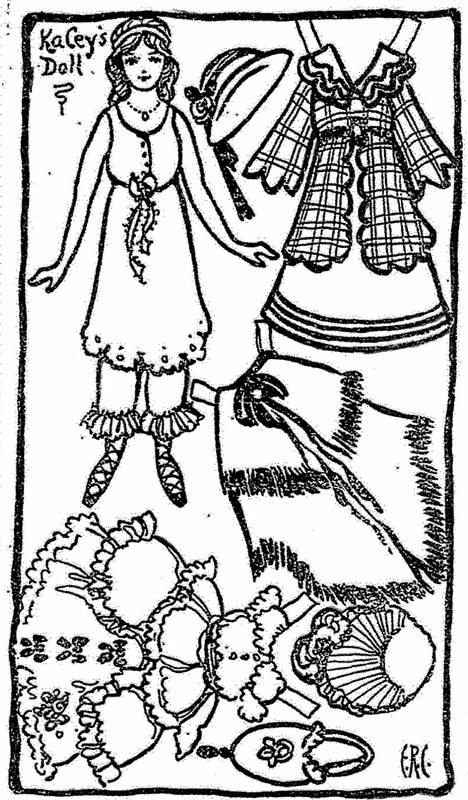 A Doll and Her Dogs by A. W. Nugent from January 08, 1933. The Misadventures of Merlin Jones starred Tommy Kirk, Annette Funicello, Leon Ames, Stuart Erwin, Alan Hewitt and Connie Gilchrist. It was directed by Robert Stevenson. A Disney comedy about mind-reading and hypnotism. 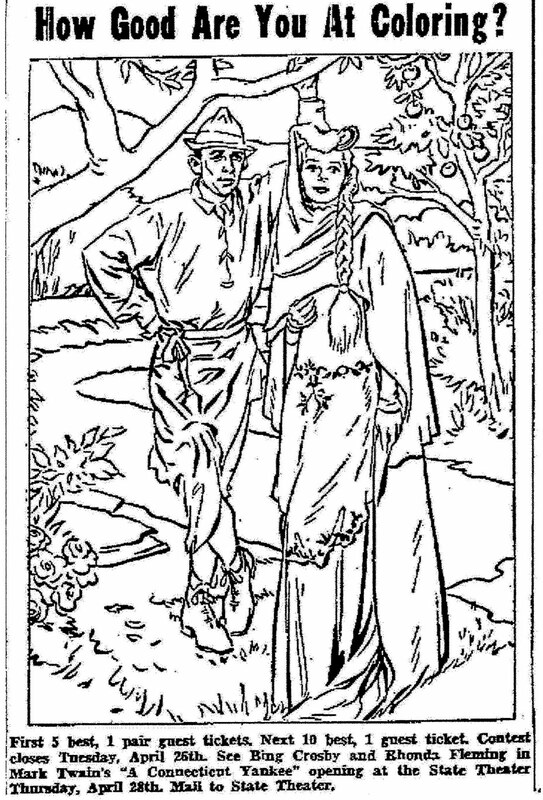 There was a sequel called The Monkey's Uncle. 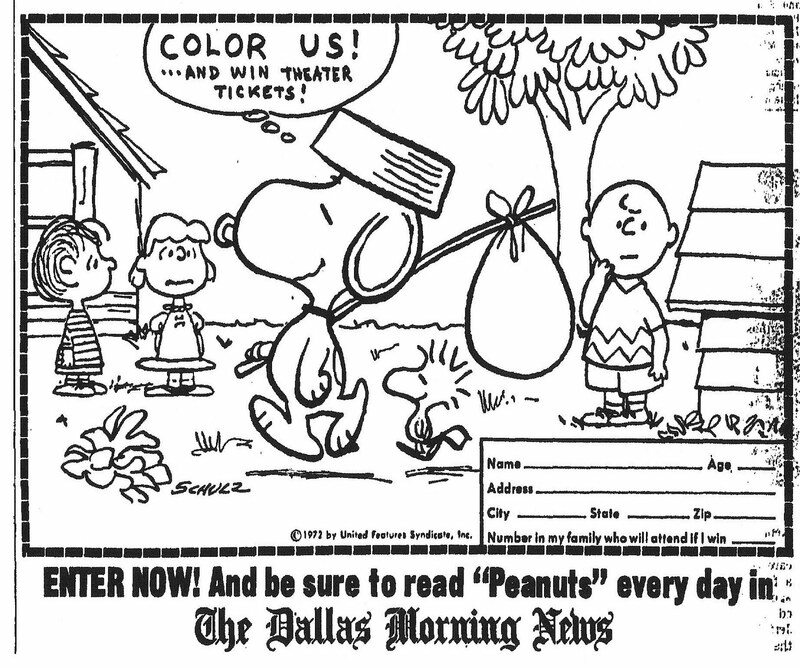 This coloring contest ran in February of 1964. 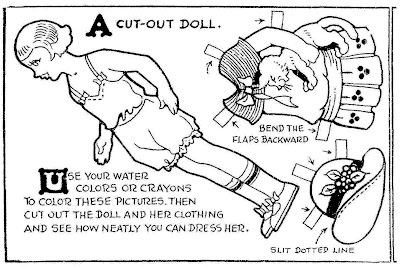 This doll by A. W. Nugent appeared in the Oakland Tribune on June 18, 1933. 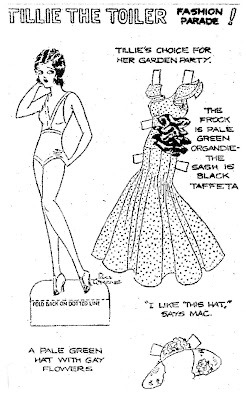 KaCey's Doll appeared in the Aunt Elsie Magazine section of the Oakland Tribune on September 21, 1919. This was the first in a series of pictures for kids to color in the SWISS MISS INSTANT HOT CHOCOLATE MIX Coloring Contest. 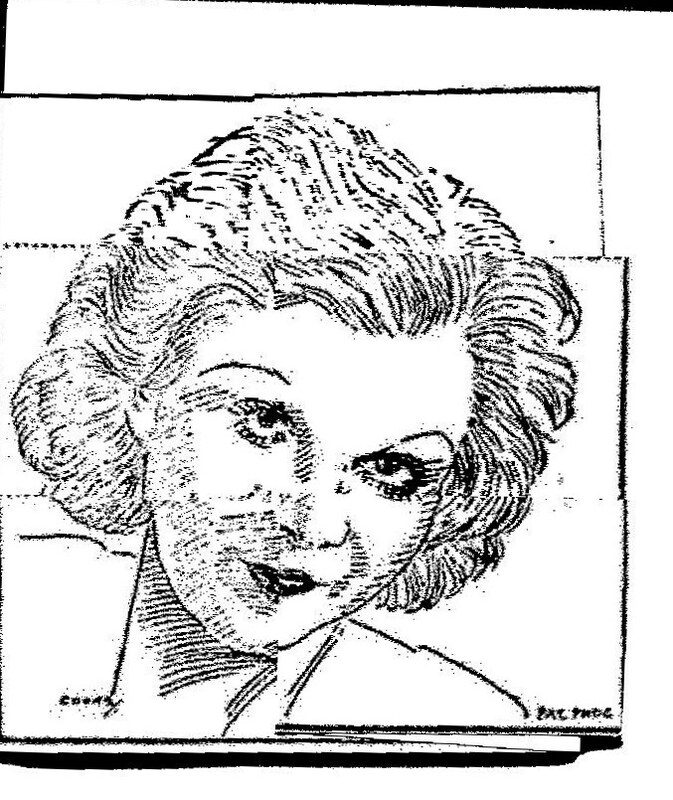 The contest ran in the Billings Gazette in February of 1962. 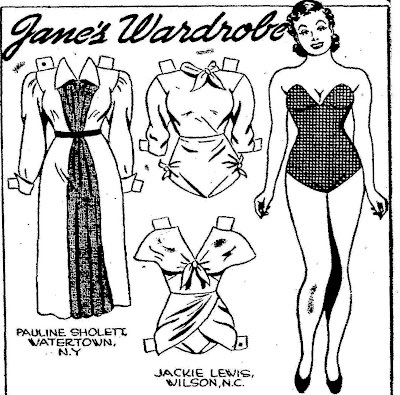 This Tillie paper doll appeared in the comics section on July 23, 1950. 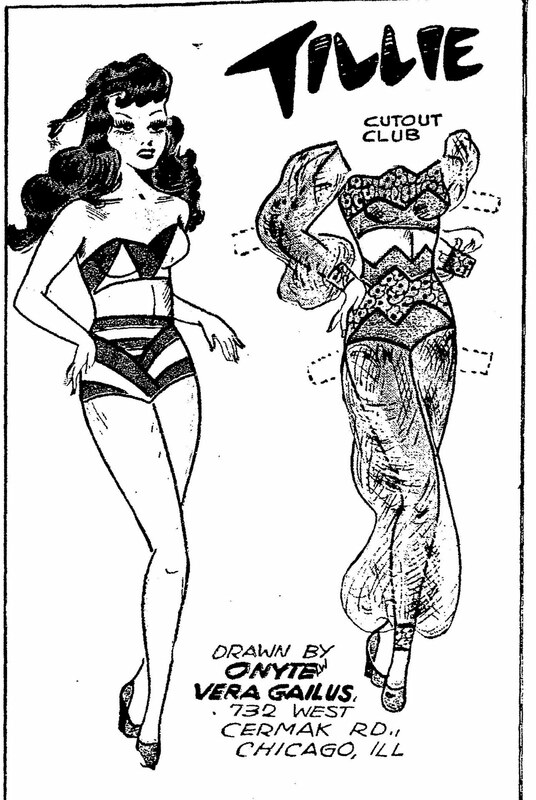 It seems that Tillie beat Barbara Eden to the harem-girl look. 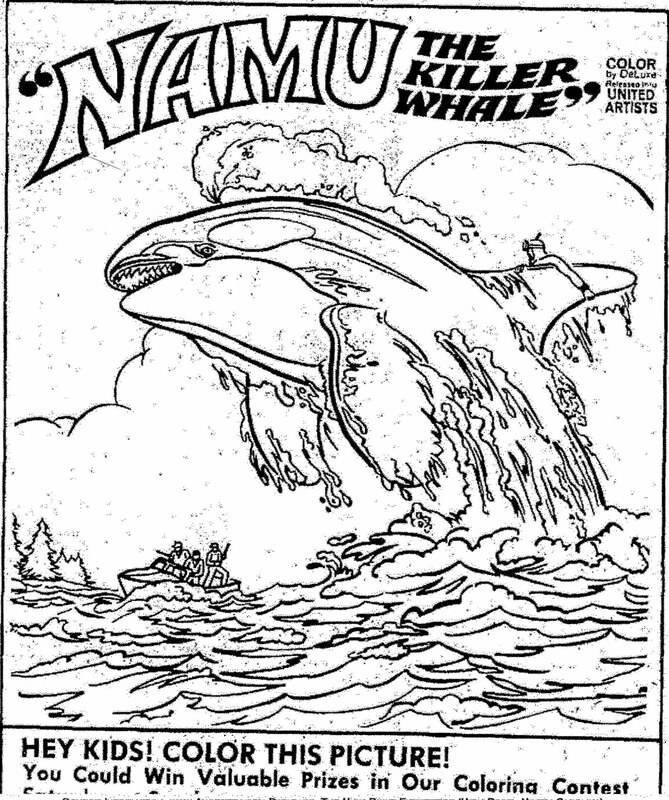 NAMU, The Killer Whale starred Robert Lansing, John Anderson, Lee Meriwether, Richard Erdman and Robert Mattson. Directed by Laslo Benedek. 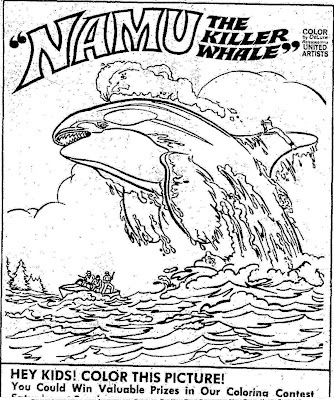 Intriguing tale, based on true story of naturalist Lansing capturing and training a killer whale. 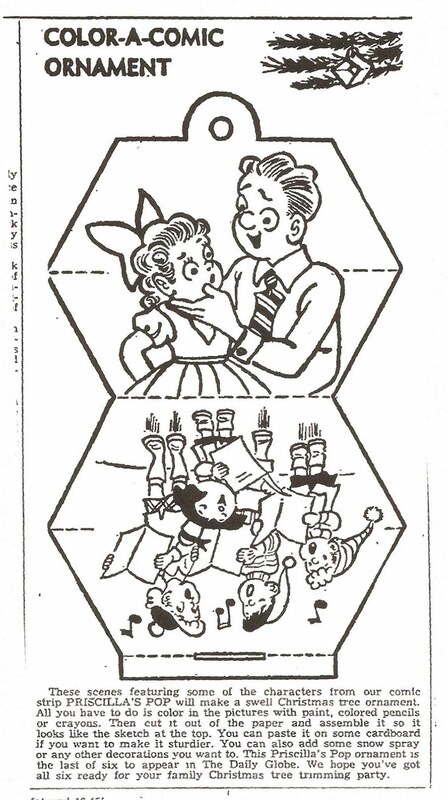 Nicely done, good family fare - from Leonard Maltin's Guide to Movies and Videos. Is that really how Lee Meriwether spells her last name? I have never seen this movie. 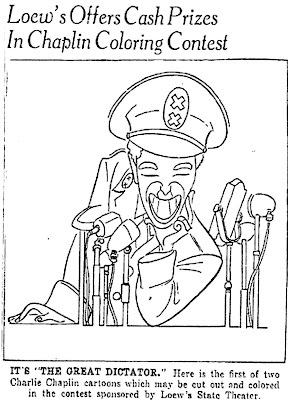 The following information is from Leonard Maltin's Movie & Video Guide: THE GREAT DICTATOR (1940) Director: Charlie Chaplin; Starring Charlie Chaplin, Paulette Goddard, Jackie Oakie, Reginald Gardiner, Maurice Moscovich, Billy Gilbert and Henry Daniell. 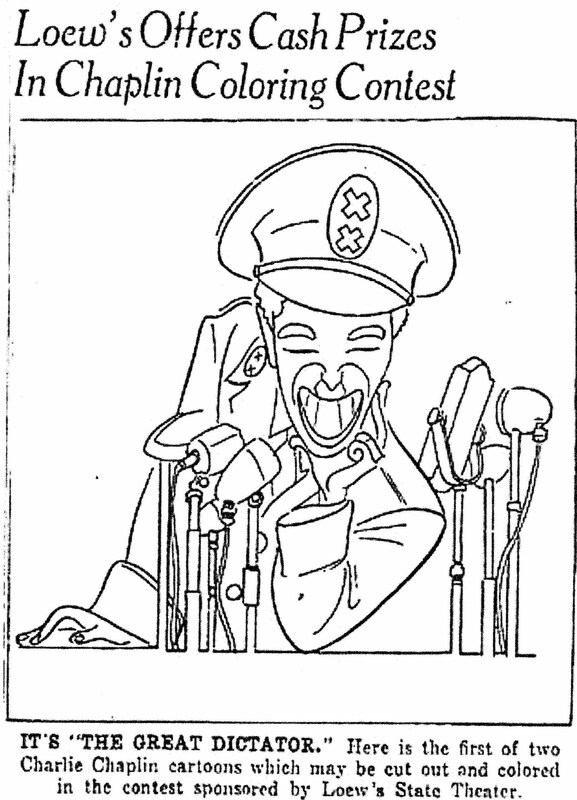 Chaplin's first full talkie; unusual comedy combines slapstick, satire and social commentary, as he plays dual role of Jewish ghetto barber and dictator Adenoid Hynkel of Tomania. Unique, surprisingly effective film also features Oakie in unforgettable portrayal of "Benzino Napaloni" of rival country Bacteria." 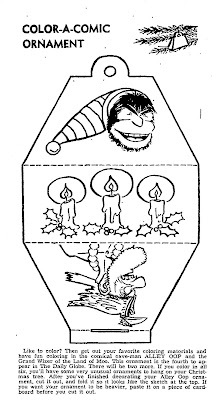 The two caricatures used for the coloring contest were drawn by the famous caricaturist, Hershfield. 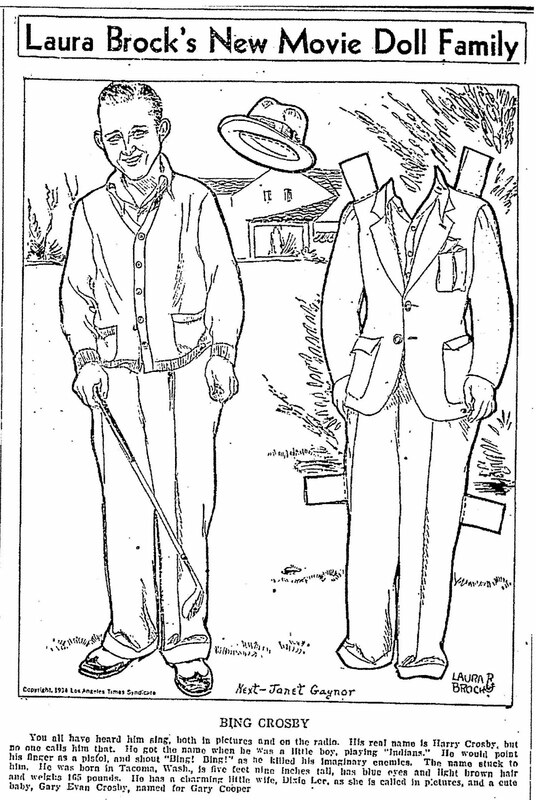 The contest appeared in a New York newspaper in October of 1940. 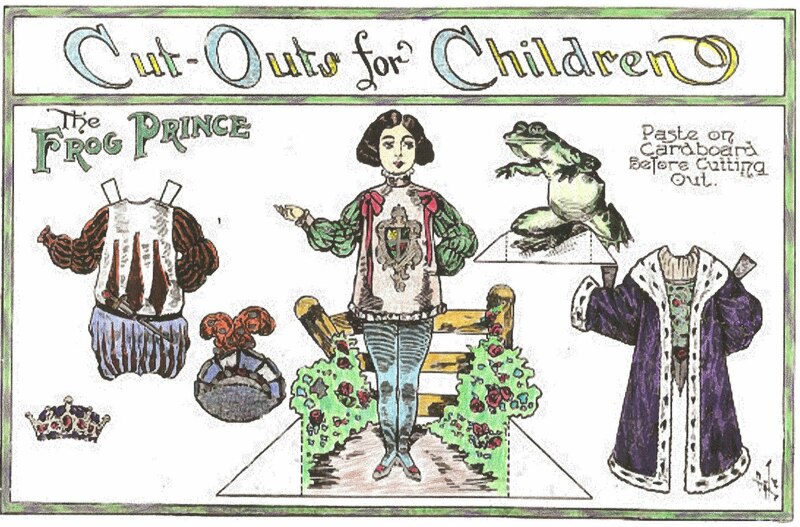 Cut-out Toads and Toadstool are from September 18, 1932 and Puss & Tom Katt are from January 15, 1933. A. W. Nugent created a wonderful page for children that included paper cut-outs, mazes, hidden pictures, connect the dots and much more.